Globalstar Europe Satellite Services Ltd*, announced today that its technology is at the heart of the SaveMyReindeer solution. Developed by specialist animal tracking provider, FindMy, this IoT solution is designed to prevent trains from colliding with reindeer in Norway’s hinterland. Hundreds of kilometres of Norway’s railroads, reaching inside the Arctic Circle, traverse territories inhabited by the region’s indigenous Sami people, for whom keeping herds of reindeer as livestock has for millennia been central to their culture and economy. These animals roam free, often migrating into Sweden and Finland. Each year, trains kill about 6,500 of the Nordic region’s 600,000 reindeer, with an estimated loss of €8.5 million of livestock. In 2016 the Norwegian mapping authority, Kartverket, sought a solution as part of its annual hackathon series. FindMy emerged the winner and SaveMyReindeer was developed as a proof of concept. FindMy, formerly known as FindMySheep, uses the Globalstar network and STX3 chipset for its animal tracking collars and services, including SaveMyReindeer. SaveMyReindeer uses data from the Norwegian Railway Directorate on the real-time location of each train combined with open data from Kartverket to create a moving geo-fence 40-50 km around the train. By comparing the geo-fence area with GPS data from FindMy collars already keeping tabs on reindeer, the system warns train drivers when they are approaching the animals so they can either accelerate to get out of the herd’s way, slow down or stop the train. 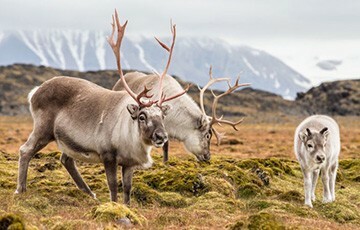 The reindeer owner simultaneously receives an alert on their smartphone warning them that their animals may be in danger, giving them the opportunity to move the herd out of harm’s way. Because reindeer are herd animals, any collision with a train can injure as many as 50 of them at a time. Train conductors are authorised to carry guns to humanely kill any seriously hurt animals, but soon this will no longer be the case. Now, local authorities will be dispatched to deal with injured animals. With SaveMyReindeer, Globalstar’s satellite network will give these agencies the precise GPS location of the incident so they can reach the location quickly. As well as fewer reindeer deaths, preventing collisions reduces the impact of trauma on train staff and improves the reliability of the train service. The SaveMyReindeer system is now being considered for testing elsewhere on the Norwegian national railroad system. FindMy and Kartverket are also considering how this system could make Norway’s highways safer. The solution could feed warnings to smart signs – live electronic displays which indicate optimal speed limits based on current weather conditions and traffic, and which mitigate the dangers of animals roaming onto highways.